Kiwi rallied although RBNZ left the OCR unchanged at 1.75% as anticipated. The central bank did turn slightly more dovish than in November but the market had expected more. The central bank indicated that “the tailwinds to growth have eased” while “trading-partner growth is starting to slow”. It also pushed the timing of the first rate hike. It also retained the stance that the next move could be “up or down”. At the press conference, Governor Adrian Orr signaled that the risk of a rate hike has NOT increased, this is interpreted positively by the market as a sign that the chance of a rate cut is diminished. Domestically, RBNZ acknowledged that employment is “near its maximum sustainable level”. Yet, the also noted that core inflation has stayed below the midpoint of the +2% target, thus requiring “continued supportive monetary policy. With exports of commodity the key revenue source of the country, weakening in global commodity prices have reduced “the tailwind that New Zealand economic activity has benefited from”. Globally, growth in New Zealand’s trading partner should “further moderate” this year while “the risk of a sharper downturn in trading-partner growth has also heightened”. The members affirmed that there are “upside and downside risks” to the above economic outlook. 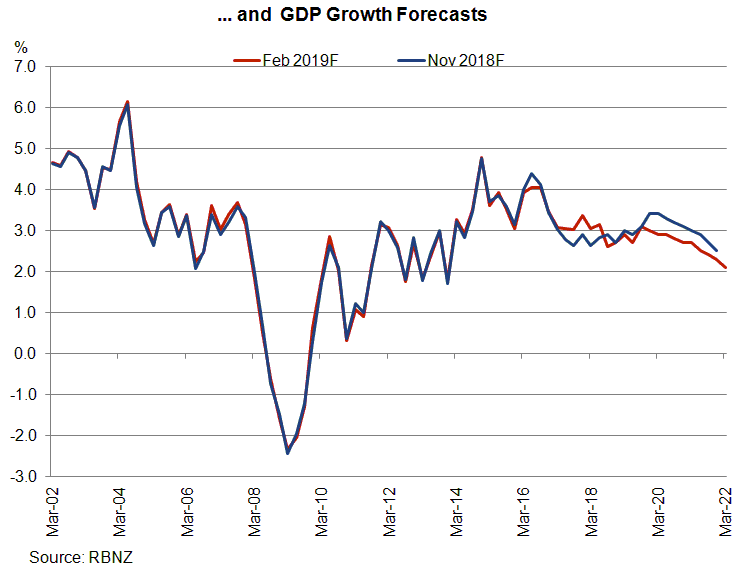 As noted in the Monetary Policy Statement, RBNZ has downgraded the GDP growth and inflation forecasts for this year. On the monetary stance, RBNZ reiterated that “low interest rates” would be needed to support an improvement the country’s economy growth over 2019. As such, it reiterated that stance to keep the policy rate at an “expansionary” level for “a considerable period”, while reinforcing that “the direction of our next OCR move could be up or down”. The central bank noted that the policy rate is expected to stay at the current level “through 2019 and 2020”, a slight tweak from November’s “through 2019 and into 2020”. Looking at the Monetary Policy Statement, RBNZ now sees a rate hike to come in at March 2021, compared with November’s forecast of 3Q2020. Interestingly, this is an upside surprise for the market, which had almost nearly fully priced for a rate cut by the end of this year.